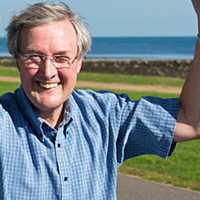 Captain Robert Gray, from Carrickfergus, shares his experience of prostate cancer. I have spent over 50 years as a seafarer dealing with all sorts of difficulties, but when I was told I had prostate cancer and it was an aggressive sort, I felt I was in a worse predicament than the captain of the Titanic. I had no control over what was happening and this was a totally new experience for me. It had all started with a phone call from an old shipmate. I had a slight need to pass water more frequently, which I thought was part of growing old and had not realised was a symptom. My friend Terry mentioned in conversation that he'd had a Prostate-Specific Antigen (PSA) Test. As I hadn't a clue what this was, he explained the test measures the blood level of PSA, a protein that is produced by the prostate gland. A raised PSA can indicate an infection or enlarged prostate, but also the presence of prostate cancer. A couple of weeks later, I went to the GP and had a blood test for PSA and was surprised when my doctor phoned the next morning with the result. I then had a biopsy three weeks later. I would urge anyone who is concerned about their symptoms to go and see their GP as soon as possible. When the diagnosis was given, I was shocked. I was 67 at the time but in good shape. I attended the gym three times a week, walked and played golf, how could this happen to me? My wife and I felt the earth had moved and sat in shocked silence while listening to what the urologist had to say. I would start hormone therapy immediately, have a CT scan and MRI scan to see if the cancer had spread. During that time I feared the worst that the cancer had spread; the wait for the results seemed like forever. So when the doctor told us that the scans had shown no cancer outside the prostate, I was overjoyed. I was told that the scans were clear and that the cancer was within the prostrate. Things were looking better! I was told that I'd continue the hormone therapy for about two and a half years and I would be given about seven and a half weeks of radiotherapy. My treatment finished in March 2013 and I am now reviewed every six months. I’m fine now and have always felt OK. The radiotherapy wasn’t as bad as I thought it would have been and I was able to continue to go to the gym and play golf. Now I take each day as it comes and appreciate my wife, three children and five grandchildren all the more. I would urge anyone who is concerned about their symptoms to go and see their GP as soon as possible. It is better to know what you are dealing with and then you can face it head on. So the Titanic may have sunk, but this captain plans to go on to complete many more voyages.